"If the Government of Sri Lanka fails to accept the Interim Administration proposals that we have developed with the assistance of our legal and constitutional experts and consultations with many Governments of the West, the Sri Lanka Government will have to face severe international displeasure," said Col.Karuna during a special interview to a local daily when he arrived at the Illupadichcheni sports ground on his return from his foreign trip. "Our expert panel examined constitutions and administrative architectures of several countries when drafting the proposals for the Northeast Interim Adminstration. The Proposal will be submitted to our leader Mr.Pirapaharan immediately, and with his approval it will be handed over to the Norwegian Facilitators before the 26th of October. 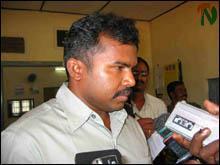 It is now left to the Government of Sri Lanka to invite us for further talks," added Karuna in his interview. When Col.Kauna was asked if the LTTE is willing to attend the peace talks if it was held before the GoSL has reviewed the submitted proposals, he said, "We are ready to attend the peace talks any time and we will join the talks even if the GoSL invites us before reviewing our proposals." On the question of Muslim participation, Col. Karuna said, "We regard Muslim people living in the Northeast as a segment of Tamil people. We are firm in our committment that Muslim people shall enjoy every right the tamil people enjoy. We would like to stress the need for the Tamils and Muslims to live together in amity in the homeland of the Tamil people." Batticaloa-Amparai Special LTTE Commander T.Ramesh, Commander Prabha, Commander Robert, Batticaloa-Amparai district Head of the Political Wing, E. Kausalyan, and several other LTTE members were present at the Sports ground to welcome Col.Karuna when he arrived in a special Sri Lanka Air Force (SLAF) helicopter, sources said.